What do you get when you take the exotic spices of India and combine them with classic French cooking and a whole lotta drama and cultural clashing? 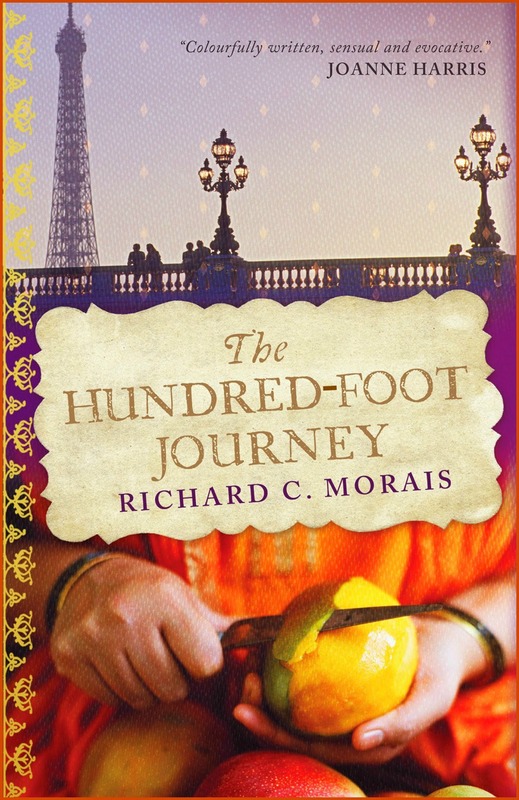 You get The Hundred-Foot Journey by Richard C. Morais. For our October/November read, Cook the Books joined forces with Food 'N Flix for an optional crossover event, hosted by me (Deb of Kahakai Kitchen) on the CTB side and Camilla of Culinary Adventures With Camilla, the host for December's Food 'N Flix. Participants could read the book as usual, or read the book and watch the film inspired by it, and then make a dish inspired by either or both. There were mixed feelings about the book, some loved it, some didn't. Many of our book and movie combo participants liked the movie more than the book. But, one thing everyone agreed on is that it inspired some really delicious dishes. For our CTB roundup, I am breaking down the entries into the ones inspired by just the book and then those who took the optional book and film challenge. The lovely Camilla will be rounding up both the movie-only and the movie and book combo entries for Food 'N Flix on her site. Besides viewing the entries and visiting everyone's posts here, please go check out Camilla's round-up (find it here) as well--to see what dishes the film inspired. Crossover-event co-host Camilla of Culinary Adventures with Camilla was first in with her book-inspired dish. Camilla re-read the book on a beach "staycation" and found that "reading it again, with a focus on the food instead of the story, it was quite enjoyable. His prose is rich and luscious. Just ignore the potholes in the plot." Camilla and her son made Sungta ani Bende Kodi (a 'slightly nontraditional' Prawn with Okra Curry). She says, "We wanted to use seafood and I had okra and eggplant. So, this is blended recipe based on something traditional and some pantry-based additions. We thoroughly enjoyed the tang of tamarind mixed with the sweet creaminess of coconut." My fellow Hawaiian Islands blogger, Claudia of Honey From Rock took inspiration from Hassan's "first sensation of life ... the smell of machli ka salan, a spicy fish curry, rising through the floorboards to the cot in my parents' room above the restaurant." For her Machli Ka Salan adaptation, Claudia says, "I used Hawaiian opah or moonfish, but you can use any firm white fleshed fish for the curry that is locally available. I added the fish head to my curry for more depth of flavor and richness. You can omit it or remove it before serving. ... I served the stew with a side of cucumber salad in kefir dressing, some salted lemon preserve and guava chutney. The flavors of India come through so enticingly in this dish, it's just incredible. Love a good spicy curry." Next up is CTb co-host Deborah from Eliot's Eats who thought the movie version more enjoyable, finding the book "a bit dark and depressing." 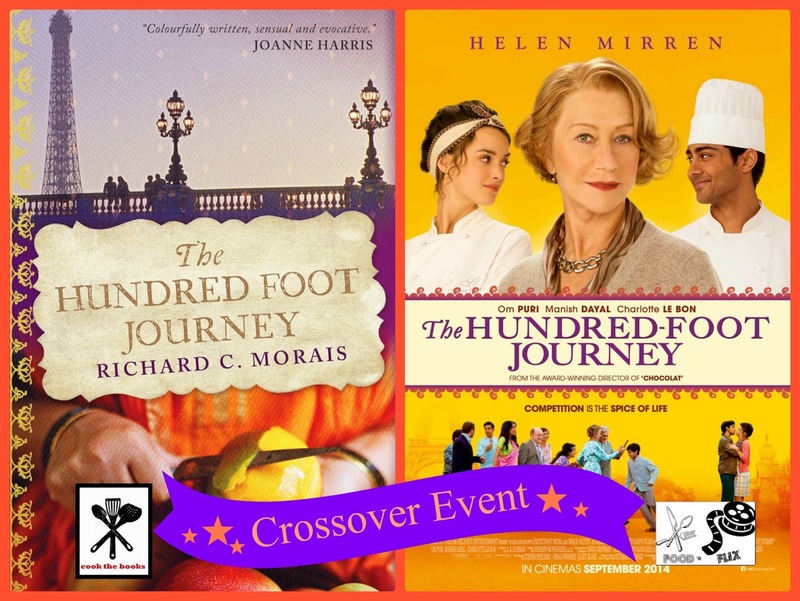 Having made an Indian-inspired dish for the film, Deborah decided to make a classic French dish, saying "I am celebrating the other cuisine featured in both the film and the novel with Boeuf Bourginon. 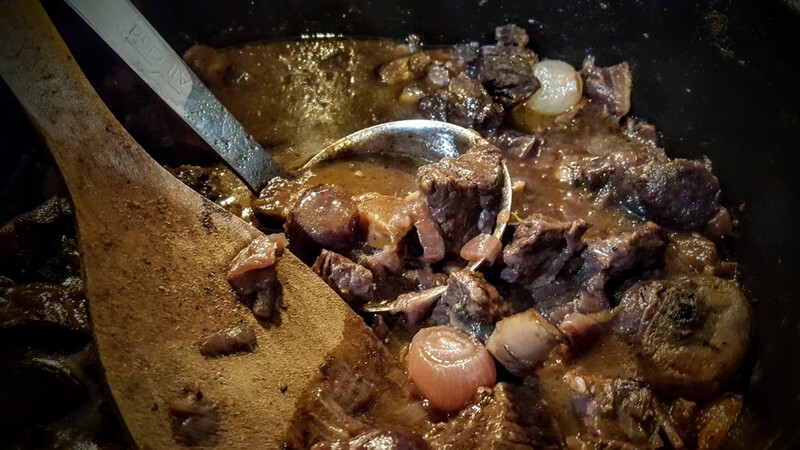 Boeuf Bourginon is mentioned in the final pages of the novel as it is being compared to a similar Indian dish. ... This dish has become a recent holiday tradition for us. We were first served this recipe at an extend family Christmas party last December. It was so good, we decided to beg for the recipe and we made it for our more immediate family on Christmas Eve." Cook the Books co-host Simona of briciole liked the book up through the midpoint and found the setting in the French Alps most interesting, inspiring her to make homemade Crozets--a style of pasta from the region. Simona says, "The book has a lot of dishes in it, but what intrigued me was the location of the French village where the protagonist's family moves, the Jura, so I did some research on French mountain cuisine and read about crozets, a type of pasta typical of Savoie (which is south of Jura) traditionally made "from wheat flour, buckwheat or a mixture of both." ... Traditionally this pasta is used to make gratins and I was planning to do something along those lines, but an unwelcome cold requiring chicken soup therapy for my husband sent the crozets into hot chicken broth." 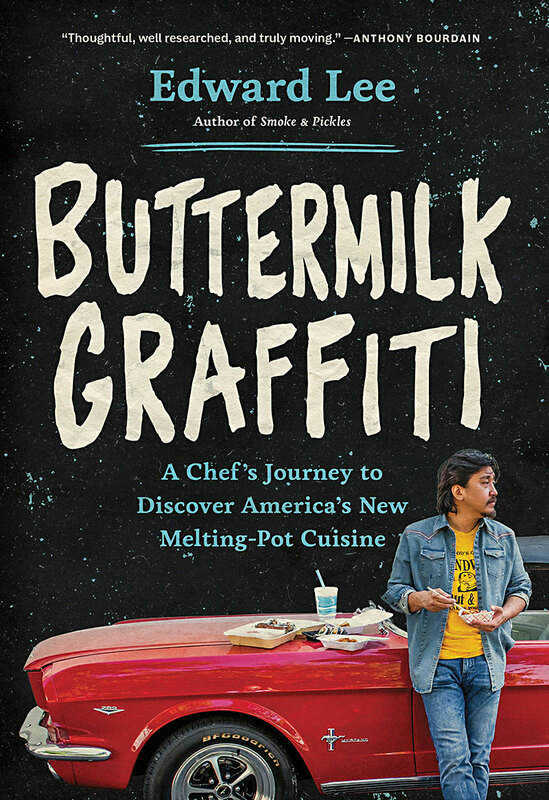 Our first joint book and movie entry came from Amy of Amy's Cooking Adventures. Amy was not a fan of either the book or film--giving up on the book partway into the story (a rarity for her) and then enjoying the movie up until about halfway through, as the focus began to shift from the family opening the restaurant in Lumière. Still, she says, "Happily enough for me, I was able to find food inspirations in both the book and the movie. In both, there is the opportunity to focus on French, Indian, or fusion cuisine. ...I decided to push myself way out of my comfort zone and try my hand at (probably not very authentic) Indian food." 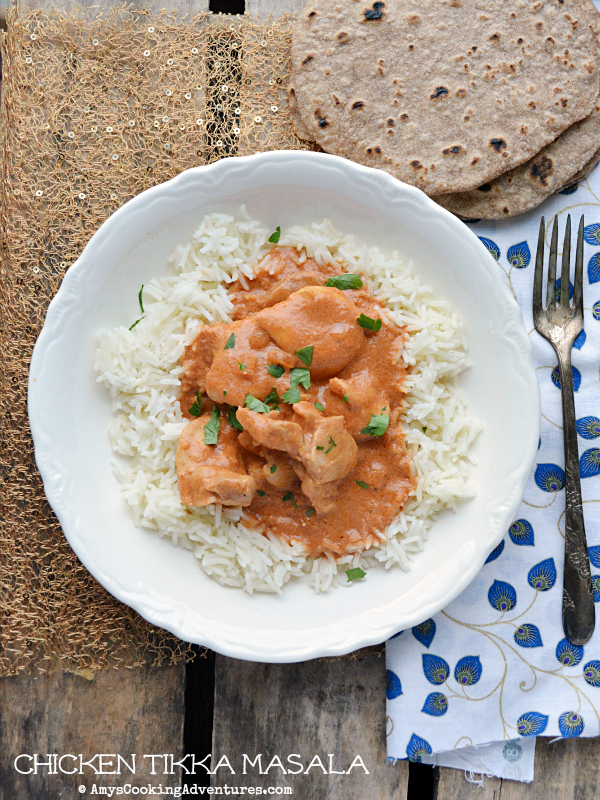 Wendy made Chicken Tikka Masala, which she served with rice and homemade Chapati and found that "the recipe was a huge success! The entire family loved it and since it was a crockpot recipe, it was super easy, too!" 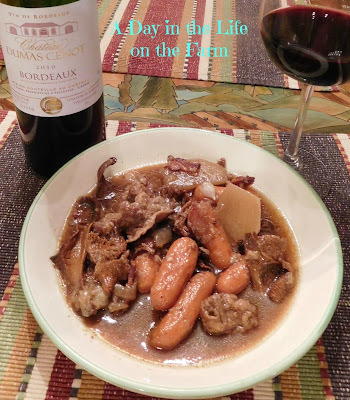 Wendy of A Day in the Life on the Farm enjoyed both the book and the movie saying about the book, "...there was certainly tons of food inspiration from Indian to English to France to Fusion when Hassan starts connecting the two cultures. Hassan also decides to start cooking cleaner and locally, earning him the coveted 3rd Michelin star. All of this, of course, comes at a price but you will have to read the book if you want to know what that cost was." For her dish she chose a variation of "...Beef Bourguinon a la Hassan created for the movie by Chef Floyd Cardoz. This is the first French dish that Hassan gives to his father in the film after leaving their restaurant to work for Madame Malory. It was a very touching scene with some humor included when he tried to have his younger siblings try it." It is a pleasure to have one of my favorite Food 'N Flix peeps, Evelyne of Cheap Ethnic Eatz, join us for the first time at Cook The Books for this special crossover event. Evelyne says, "I have mixed feelings on both the book and the film. The first half of the book – when in India and in small town France – is such a wonderful read. The second half in Paris I though was terrible. I know I am not alone as I read this with a book club and everyone agreed. The movie makers thankfully felt the same way and basically skipped most of the Paris story. The movie also took a lot (and I mean a lot) of creative license when compared to the book. In the end I think I preferred the movie for its entertainment value and to see the gorgeous food I read about. There was no lack of inspiration for sure when picking a dish to make. But my Carrot Curry Canelés recipe is not featured in any way, I also took a lot of creative license for my inspiration." Liking the book, the film and the combination event, Terri of Our Good Life says, "This month Food 'N Flix and Cook the Books combined forces to do one book/movie pick. The one they picked, The Hundred Foot Journey, was such a great combination. For me, the book and movie were vitally different, which makes for interesting conversation at your book club!" For her book and film inspiration Terri chose Bacon-Wrapped Asparagus and says, "I chose to do a simple but classic French vegetable preparation, which is asparagus and bacon. ... The asparagus retains a nice crunch and is seasoned with the salt in the bacon. No added fat is needed. If you want to impress, try this dish!." Finally at Kahakai Kitchen, the movie appealed to me more than the book as it brought the story and the food to life so well (and I adore Helen Mirren!) ;-) My plan to do two separate dishes and posts got lost in the mire of work deadlines and the holiday shuffle, so in the spirit of both the book and movie, I took a classic French soup and added some touches inspired by some of my favorite Indian cuisine ingredients--This fusion Potage Parmentier with Cilantro Pistou and Curried Naan Croutons. 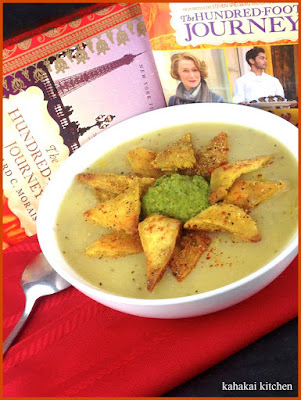 The tangy and sightly spicy cilantro pesto and the (totally addicting) crispy-fried curry croutons really livened up a simple potato and leek soup. A big mahalo (thank you) to Camilla for co-hosting the crossover and to everyone who joined in either reading the book, watching the film, or doing both! If you missed out on this round of Cook the Books and you love food, books, and foodie books, consider joining us for our December/January selection: A Place at the Table, by Susan Rebecca White--hosted by Debra, of Eliot's Eats. And, side note--if you like your films to be inspired by foodie fiction, join our friends over at Food 'N Flix where the December film pick is The Jane Austen Book Club, hosted by Kimberly at Coffee and Casseroles and inspired by the 2004 novel by Karen Joy Fowler. As with Cook the Books, Food 'N Flix is open to everyone! Aloha and have a safe and joyful holiday season! Thank you so much for your kin comment (ditto) and loved doing this cross over club recipe. Was so much fun! Thanks so much for hosting and for making this a double bubble with Cam. I just love our wonderful group of bloggers.